Why is a Rigid Hull Inflatable Boat (RHIB) most often the vessel of choice for Professional Mariners, Maritime Law Enforcement Agencies all over the world? A RHIB has many unique handling and performance characteristics, making it the craft-of-choice for varied mission profiles. Compared to a conventional, hard-sided boat of the same length and power, a RHIB is generally lighter in weight and has a lower center-of-gravity. It also has a higher load carrying capacity than comparable sized hard-sided design and the tube-set allows for ancillary seating positions. The OCM RHIB uses a unique, concave hull chine design. As it moves through the water and impacts waves, the concave chine acts to direct the water downward thereby creating extra lift and reducing the wetted surface and friction drag of the hull. The combination of lighter-weight and reduced friction, translates into increased overall top-speed with reduced fuel consumption and fuel cost and results in an increased overall operational range per gallon of fuel carried and consumed. The inflatable tube-set (also sometimes referred to as a sponson or collar) provides the craft with wonderful lateral stability and abundant reserve buoyancy. Even when the vessel is deliberately overloaded to one-side with unevenly distributed weight, the air holding tube could then be forced by this weight to touch the water, but its inherent and abundant buoyancy prevents the vessel from tipping further or capsizing. To dispel a common misconception about RHIBS; when a properly designed RHIB is at rest or underway in nominal operating conditions, the tube-set or collar does not contact the water except to deflect occasional sea-spray, and it is NOT required for buoyancy to keep the vessel afloat. In fact all of the Ocean Craft Marine RHIBS undergo rigorous certification testing to ensure that they stay afloat and remain operable while carrying full-loads with no tube-set inflation. Where a RHIB boat’s collar really shines is when the vessel encounters significant sea conditions as it is then, that the RHIB’s collar becomes a dynamic, intrical part of the vessel, greatly aiding its performance characteristics. The flexing action of the collar absorbs and mitigates the shock of the wave’s impact. It lessens the depth by which the boat submerges during successive waves, and it also serves to lessen the chance of accidentally burying the bow into a rouge or miss-timed wave. The collar also provides the RHIB another hydro-surface to aid stability and agility during high-speed, high-angle turns. A RHIB, whether using a pneumatic, a foam-filled or a foam-air hybrid tube-set enjoys built-in, there are fenders on all sides so there is no need for additional fenders. This makes a RHIB the ideal platform for underway boarding operations, crew and equipment transfers and law enforcement stops all with relative ease and no damage to any vessels or adjacent objects. As many mariners involved with any type of water rescue and recovery operations will tell you, a RHIB’s lower freeboard height and soft-sided tube-set makes personnel rescue and recovery easier, safer and is ideally suited for the recovery technique of par buckling. Ocean Craft Marine uses quality materials to manufacture and produce all products. We realize the importance of quality fittings, however small, are critically important in the safety and enjoyment of your boat. Only HypalonTM is used in the manufacture of the OCM tubes. 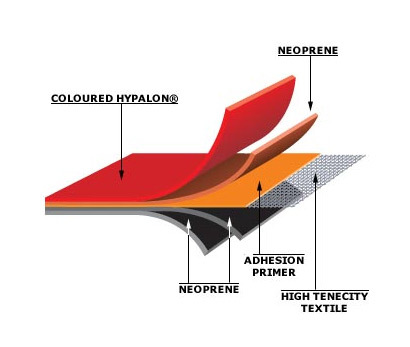 At OCM, we do not believe that a PVC product can provide the longevity and safety that can be compared with the multi layered Hypalon fabric. All materials are incorporated into the OCM Warranty. Ocean Craft Marine knows that whether you are using your boat for Recreational or Commercial applications, the most important factor for your rescue mission or for your family and loved ones is that our boats perform in a functional and safe manner. OCM is committed to safe boating. Rigorous testing is performed on each boat before introduction in the market. This is why we offer and recommend sea training on all boats.